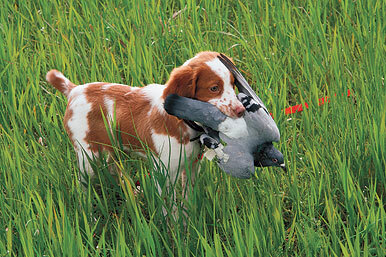 Don't get upset if your young gun dog puppy traps or grabs a bird. It's bound to happen sooner or later, and it doesn't mean he won't develop his pointing instinct. There are, of course, those who would disagree. They want their dog to sit, come to the whistle, whoa, and dance the hootchi kootchie before it ever sets eyes on a real live bird. Most of these folks are in the retriever camp, and if there's one thing I've learned in my admittedly limited experience with retrievers, it's that I don't want to argue with the people who own them. It's entirely possible to buy or build a small cage, say three by three feet, set it up under your porch eave or someplace else protected from the weather, and stock it with two or three pigeons, all you'll need for the first few weeks of your pup's exposure to live birds. Since, initially at least, you'll want to tether or cage your planted birds so they can't fly away, losing them won't be a problem. Another way, and a good one, is to join the nearest sporting dog club and attend their weekly or monthly training sessions. They'll have birds you can buy or rent. But if neither avenue is open to you, a workable option is happy timing. Happy timing is a term a mentor of mine explained to me long ago, which simply involves taking your pup out for runs in the country. He'll learn to point or flush whatever birds he finds, as well as grasshoppers, horses, and anything else that catches his fancy, and he'll learn to hunt too, as the world comes alive through the wonderful nose he's beginning to discover. In fact, this is something I recommend to anyone with a puppy, whether or not they have penned birds at their disposal. How often should you do this? You can't do it too much. Several times a week, minimum, and once a day isn't pushing it. I suggested both owners take their dogs for happy-time runs, letting them find and chase all the trash birds they wanted. Surprisingly--I'm always surprised when people act on my advice--they did. This spring, a year later, both dogs were back. Both, at around a year of age, had had months of happy-time runs (as well as an occasional planted quail). Annie's drive to find birds and point them was stronger than ever. And June had made a complete turnaround. Birds were now the center of her existence. Her drive to hunt, in fact, was strong enough that I've been able to jump ahead with the next phase of her schooling. What you eventually want, and what you should look for, is a puppy that is actually hunting--scouring the grass for scent, using his nose and his eyes to find the bird he knows is there. When he does that, if only for a few seconds at a stretch, he's arrived. You could, if you wanted to, take him off birds at this stage, but I never do. It's just too much fun watching them develop. If your pup grabs a pigeon, take the bird away forcibly but gently, and don't reprimand him! Then, plant future birds in a bird box. You can easily make one yourself, or buy one of the heavy wire trap baskets that serve the same purpose. Much later you can plant birds in actual traps, the type that spring a planted pigeon or quail into the air. But don't use these on a very young dog--the noise may scare them. Getting your puppy into birds on a regular basis takes effort, but of all the stages of dog training, this is the one I enjoy most. Missing a puppy's first point is like missing your kid's first football game. True, you'll both get along without having had the experience. But do you really want to?